There is but one announcement in this morning's Vatican Bollettino, and it might be of interest to more than a couple of our readers here in the States: Benedict XVI accepted the resignation of Gordon Bennett, SJ, as bishop of Mandeville, Jamaica. The resignation of the 59 year-old prelate was offered under Canon 401, paragraph 2 -- i.e. the section of the law which deals with "because of ill health or some other grave cause." Forgive me for being absolutely shocked. 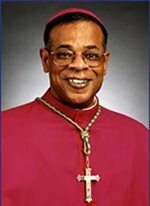 Just the other day, I was on the phone with a friend who had been in recent contact with the bishop, and apparently everything sounded fine -- so fine that we mused on Bennett's possible appointment as archbishop of Kingston in succession to the 73 year-old Lawrence Burke, also a Jesuit. The chances of that seem to be lessened now. And what's unfolding is anyone's guess. As soon as I find out, I'll let you know.